Not So Grumpy About Grumpy’s Open Mic Anymore…. MONTREAL – I have always felt quite reserved, even grumpy, about taking part in open mics that are a mix of comedy and music. 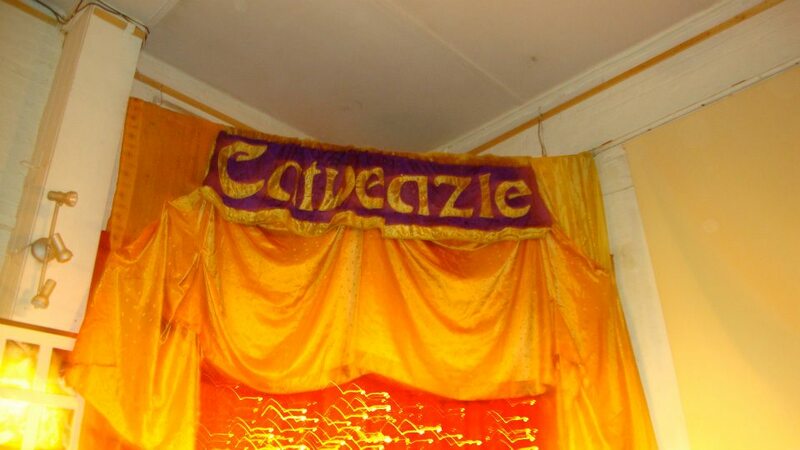 I’ve always felt there is nothing worse than getting up on stage to play a sad, sensitive, woeful song just after some humourist who has had people falling off their seats with laughter and mirth. How do you turn around that feeling of lightness and well-being, even a sense of the absurdity of life, with a quiet intervention of a song immediately afterwards? How, even worse, does the singer switch from that very same feeling of being elated by comedy to reaching into the depths of sadness or melodious sensitivity in a split second? Well, last night at Grumpy’s open mic, which mixes comedy and music, I decided to set myself up for the ordeal again. Grumpy’s bar is one of the rare places I’ve taken part in a comedy and music open mic, by the way, and last night it got far, far worse than usual, as 95 percent of the acts were comedy, with just a small handful of musicians, most of whom were tagged on at the end. But something I did not expect happened last night. I’m really sorry to be so nasty in saying this, but my feeling – and maybe it was warped, since I was sitting in a back room, freezing from the winter breeze wafting in all night – last night was that there is a situation in which the comedy night can turn in the favour of the sensitive, suffering musician. That situation is when the comedians have failed to send the audience off the deep end of laughter and delight. Was it just my imagination, or was there a lot of off-colour, not-so-funny comedy at Grumpy’s last night? Am I just being Grumpy? I’m really sad to say no one sent me to the floor dying of laughter. OK, that’s what an open mic is for; I recall many an act at the original Yuk Yuk’s in Toronto in the mid-70s being not so funny – and others, killing us, of course – and look how many great acts came out of that movement? (Howie Mandel, Mike MacDonald, Jim Carrey, Rick Moranis, to name just a few.) But last night, was I really just too Grumpy about the cold and being a minority as a musician, that I was not rolling on the floor with laughter a single time? So that, much to my delight AND surprise, by the time it was my turn behind the mic, I found myself facing not an aggressive, angry audience, but not either an audience that had washed out its emotions of all pent up whatever, but an audience that was ready to break out and release some emotions. Still, I felt that it was not the moment for calm sensitive stuff, and I tried to crack a few jokes myself, like repeating that one from Monty Pythons (or wherever) about the folk musician who goes up on stage and says: “I suffered for my music, now it’s your turn.” (No one got it.) And then I laid into my song Borderline, as a warm up. The joke on that was that if all humour is at someone’s expense, and that song was at my expense, then it must be humorous…. OK, so after that, I said to myself, this audience wants to break out: So I sang “What’s Up!” and then “Mad World” and to my great, great delight, the whole place sang along and several couples danced along in front of the stage. They were ready for ANYTHING that moved by that point! And as it turned out, there were some very cool musical acts to follow, primarily an acapella group of women from Sweden – who did not want me to put up my videos of them, but said I could put up their promo videos, which I flatly refused (does the New York Times print press releases instead of doing real reporting????) and then a very funny and entertaining song and dance man from Japan. In the end, I found that what had started as a catastrophic night, primarily because I wasn’t ready to laugh, ended up a fabulous, warm experience, and great for the ego too…. In fact, I left feeling not grumpy at all. And I can thank the comics for that…. For my eighth city installment of my worldwide open mic guide today I am loading my Montreal page. As a reminder, it all started with my now very popular Thumbnail Guide to Paris Open Mics, Jam Sessions and other Live Music, and due to that guide’s success, I decided this year to do a similar guide for each of the cities I travel to during my worldwide open mic tour. I do not claim that this worldwide open mic directory is anything other than a quirky Brad Spurgeon centric guide, based mostly on my travel as a journalist following the Formula One series around the world. Montreal, like all cities is a moving target. But for me personally the mainstay joints are Grumpy’s pub and Brutopia pub, both of which offer classic open mics, and Grumpy’s has the added attraction of its open jam sessions of jazz and bluegrass. So here, now, in any case is the Thumbnail Guide to Montreal Open Mics, Jam Sessions and other Live Music. Please do help me whenever you have information to give me on the venues – i.e., especially if they close down! MONTREAL – I’ve been there before, I’ve written about it before, I’ve played there before. But I never had so much fun at Grumpy’s bluegrass jam in downtown Montreal as last night when I saw the light. The light – not the little halo around my head in the videos – had to do with attending the jam and going with the flow. The problem is that I do not know how to play a single bluegrass tune on my guitar, nor do I know how to sing a single bluegrass song. IE, I don’t know any lyrics. Oh, there’s also the “old time” aspect of this weekly jam session around a mic in this mainstay bar on Bishop Street in Montreal, but even there, I know no old times songs. Well this time, the light I saw came partly from the friendly prodding of one of the guitar player singers of the jame – which is organized by Mike Emmet, by the way – when he asked me more than once to just join in the jam and watch him play the chords and follow. This man, it turns out, is also the organizer of the Montreal Folk Festival, which begins next Tuesday and has as a featured act Roger McGuinn of the Byrds! So this guy obviously knows how to get people to take part. So I decided to forget my usual need to play a song and sing it and take up center stage. I would just join in the jam and play along. And so that is exactly what I did, and I found, beyond my belief, that I could actually to a respectable job of it. In fact, it was really mostly only three chords: D, A and G. Now what could be simpler than that?!? But there were so many musicians playing and singing together that the effect went way beyond the simplicity and into this almost trance-like situation. In short, it was a fabulous jam, an authentic jam, with authentic North American music, and some fine, friendly musicians. And boy were there a lot of them – I think sometimes there were 10 musicians playing at the same time (a little like the Quiet Man jam for Celtic music in Paris) with banjos, fiddles, guitars, mandolins and vocals). It is an added bonus that Grumpy’s, as I mentioned in the past, was one of the favorite hangouts of one of my favorite Canadian authors: Mordecai Richler. As Mike pointed out to me a couple of years ago, they actually shot a scene or two from the “Barney’s Version” film – based on the Richler novel – in Grumpy’s. So check it out! Oh, and check out the videos where you actually see me taking part in this jam. I wrote about my disappointing visit to the Grumpy open mic in Montreal the other day. Last night I decided to attend the Grumpy’s bar weekly open jam session called Moonshine on Thursday, run by Mike Emmet. This is a completely different atmosphere to the open mic on Tuesdays. Having said that, the crowd is no more respectful of the musicians, and there seems to be two different things going on in the pub during this fabulous evening. While the pub patrons stand around and chat at high volume, the musicians all gather around on the stage – which resembles a corner of someone’s living room, and play together in a circle, with a high powered omni-directional mic in the middle of the circle. The musicians can barely be heard over the noise of the bar, but every once in a awhile the patrons applaud the musicians. There is a complicity and sense of community and communion amongst the musicians, however, that makes it so that this evening is really something special: while the clients drink and talk, the musicians have fun playing together. If they attract appreciation of the “listeners,” fine. If not, that’s fine too. The only drawback to the evening for me is that this is almost exclusively bluegrass and “old time” music, or old country and hill billy kind of stuff. So although last year I sang Hank Williams’ “I’m So Lonesome I Could Cry,” this year I felt unequal to the task of playing with these musicians, so I did not take part. Having already played in one open mic, and with another waiting for me on Sunday, I knew that my stay in Montreal would not be without music. It was great, however, to see the variety that Grumpy’s is capable of delivering, from a weird and cliquey open mic on Tuesdays to a warm and family-like bluegrass jam on Saturdays. On my flight on the way from Paris to Montreal yesterday I watched the biopic about the French singer Claude Francois. At one point there is a talk between him and his manager where the manager says to him that he has to reinvent himself or he will be washed out in six months. Although I cannot compare myself to Claude Francois, and my musical career is non-existent by comparison, I was reminded of that aspect of performance as I played my set in Montreal at Grumpy’s Bar on Bishop Street. The night before, at Coolin’s Pub in Paris during the open mic I found myself in a bar I am familiar with and where many of the people are familiar with me, and the place was really crowded and loud, and the previous performer was a little too quiet for the ambiance. So I realized that against my greater desires, I had better play my “crowd pleaser” songs, despite having a set list too small to avoid doing the same three or four songs all the time in such circumstances. So I played “What’s Up!” and “Mad World,” and the effect was exactly the desired effect. The audience joined in, woke up, stomped feet, hands and whatever else they wanted to stomp, and sang along and we were as one. It was a fabulous feeling of being a mini-Claude Francois myself – or at least a Claudette…no I take that one back. Anyway, from there I went back home and to bed and the next time I really and truly woke up, I was in Montreal after my transatlantic flight in which I had a smelly, large man beside me who made work impossible, so I watched the film. 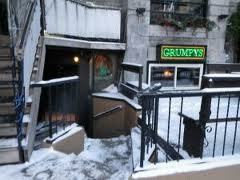 And I immediately found in Montreal that there is an open mic at Grumpy’s bar on Tuesday nights. So I went. I played at the bluegrass, old-time, evening at Grumpy’s last year, but missed the open mic. So this was new for me. Grumpy’s, by the way, has the reputation of being one of the favorite hangouts of Mordecai Richler, the deceased, acid-tongued Canadian writer – whose biography I am reading at the moment. This will be relevant in a moment…. So I go into Grumpy’s and get signed up as second on a fairly long list of performers, by the MC, Massimo, an Italian-Canadian comic. Yes, it turns out the open mic is for music AND comedy. So it was actually fortunate for me that from second on the list I got bumped to first, as the first had disappeared. Perhaps a comedian who forgot his lines. So I got on stage and found the sound system sounding pretty bad from where I stood, both the mic and my guitar. But I know how to play under any circumstances. Although the Highlander open mic in Paris is one of my favorites in the world, I have often said that it also is one of the most difficult, with THE most talkative, loud audience of people who don’t seem to listen – unless you get just the right song to get them stomping their feet hands and whatever else they feel like stomping. I have managed in recent months to break through the Highlander talk with my aforesaid songs, too. Well last night, I started at Grumpy’s with my own song, “Except Her Heart,” and I felt that there were only from two to four people in the whole pub listening to me. These were the young woman sitting directly across from the stage. The rest of the people were talking so loudly and looking so distant and so uninterested and so ungrateful that I thought I would have to load the heavy artillery and do “What’s Up!” Guess what? Was it my jetlag? No, I know I sang well, and did the same thing as usual. So I concluded that it was Grumpy’s. Because it was a night of comedy mixed with music, and because it was a bar called Grumpy’s, and because Mordecai Richler used to patronize it, I thought that for the first time in my entire short career or open mic attendance I would insult the audience back again. Generally speaking, this is NOT something you do under any circumstances. It is up to you to grab them with your music. But this time I was laughing, I wasn’t angry, and I thought it would be really fun to insult them all. So I told them I was from Paris, that I travelled the world going to open mics, and that the worst crowd I ever encountered anywhere around the world was at the Highlander in Paris. Then I said that they had now taken the place of being the worst crowd I had ever encountered anywhere on the planet. Because no one was listening to me anyway, my comment elicited no reaction. Or almost none. The only person I could see who laughed, turned out to be a guy later described as a musician but who decided last night to do a comedy routine ;- and it was the best of the night. I caught a moment on video, when he curses a step ladder: “You’re not my REAL ladder! Sorry,” he says to the audience, “that’s just my step ladder.” His whole act consisted of puns, and it was hilarious. The evening turned out to continue in mixed manner, with the audience clearly cutting the chatter when there was a regular friend of the house performing, and talking more when there was an unknown. There was only one moment when the whole crowd fell to complete silence, and that was when a guy – well known to them – went up and sang a composition he wrote the night before. Quite strange and poetic lyrics. All in all, it was a quite strange and totally bizarre evening for me as far as worldwide open mics go – but what do you expect in English Montreal?!?!?! Later, I ended up receiving tons of applause when I lent my guitar to a couple of young women who wanted to perform but had no guitar. I had finally become a star! Oh, yes, but while it did not make me doubt my abilities as such that I had been completely ignored as a singer, at the same time, I thought about that Claude Francois thing and renewing one’s songs, and approach to performing. I’ll get there; slowly, but surely, no doubt.